There is no denying the world around us is less religiously aware than it used to be. So when someone offers another “thoughts and prayers” it might be taken as meaningless and ineffective or simply a way to relieve oneself of responsibility by reciting a trite phrase. As people of faith, we know that nothing could be further from the truth. The deeper meaning of thoughts and prayers relates precisely to the command to love our neighbor. “In some ways I sympathize with the people who find the phrase ‘thoughts and prayers’ a little worn out,” said Fr. Andrew Thuringer, associate pastor at St. Mary, Aberdeen. “When I hear it, my first reaction is ‘well, I don’t really care if you think about me, but please pray for me.’ What do people mean by thoughts? Do they just take some time in a comfy chair to sit and think about people. I’m much more interested in the prayers,” he said. “As Catholics we are all connected. We share a common union (communion) with Christ,” said Fr. Thuringer. “When Catholics receive the Eucharist they are not only united to Christ, but to his entire body, the Church. So, when one of us suffers, we all suffer. When one of us rejoices, we all rejoice. And one of the clearest expressions of this unity among the Church is that we hold each other in prayer and rely on the prayers of others,” he said. How the term “thoughts and prayers” is used, and who is using it, can provide the needed context to clarify the intent. “Usually, it’s something of a throwaway phrase you hear from TV announcers after revealing that someone has died. I hear it as a catch-all phrase meaning, ‘We need to show we care but don’t really know what to say,’” said Maricarrol Kueter, a veteran South Dakota journalist who has written occasionally for The Bishop’s Bulletin. “However, I think it’s different when used by people you know. My reaction then is one of gratitude,” she said. “I have been greatly impressed – and often surprised – throughout my cancer journey by the number and variety of ways people have let me know they are praying for me,” Kueter said. “Fellow cancer patients, family members, co-workers of family members, health-care practitioners all have reached out to me through cards, notes and conversation. Every so often, for example, I get a postcard from the St. Mary’s School (Sioux Falls) staff and students saying they’re praying for me. Every instance is meaningful to me. “Prayer is such a powerful witness and it always gives me strength,” she said. Clearly then, there can be and often is a deeper meaning to “thoughts and prayers”. An essential key to loving our neighbor is to be authentic in our words. “When authentic, thoughts and prayers are a beautiful gift of self, united to the giver of all gifts, God,” said Teresa Henrickson, a counselor and spiritual director, and a member of Sacred Heart, Yankton. “What a humble gesture to bring another before the throne of the One who created us, loves and asks us to love our neighbor. “I think we all run the risk of making this a trite and hollow phrase if we don’t follow through with what we have said,” Henrickson said. “Somewhat like asking a person, ‘how are you?’ Well, do I really want to know? Or am I just asking to be polite? Similarly, I can say, ‘you are in my thoughts and prayers’ as I mosey along in my day without taking the time to actually pray,” she said. Dr. Jason Heron, who teaches theology at Mount Marty College, said that praying for another is essential to living like Christ. “I love the Catechism’s characterization of intercession as another expression of the communion of saints,” he said. “When we intercede for others, we are becoming more and more like the Son and the Spirit, who intercede on our behalf with the Father. So intercession is an essential practice if we want to live lives patterned after the Lord’s. “But we have to take care not to think of intercession as begging a reluctant Father,” said Dr. Heron. “It’s not like the Father ignores us until we’ve reached the appropriate quota of intercessory prayers. That’s a horrible thought. Instead, we should think of intercession as an eloquent expression of our ability to put ourselves in another person’s position. Intercession is an offering of compassion – suffering with – given to the God who did not hesitate to assume our flesh,” he said. As Catholics, we believe in the power and necessity of praying for others, even when we cannot see clearly what direction is needed. “We trust that God will use every circumstance that we encounter in our lives (or others) for the greater good beyond our capacity to understand,” said Henrickson. “We, by faith and experience, know that God doesn’t leave us alone in our need. He accompanies us. We can confidently and freely come before the Lord and follow His instruction of loving others, caring for others and praying for them. The power, ability and desire to do this is itself a gift or grace from God. “Praying for others can take many forms from a quick rote prayer to having a Mass said for someone, praying a Novena or contemplative intercessory prayer on behalf of another, fasting for another’s need, the list could go on. The Catechism is a treasure in teaching us how to pray,” she said. For whom we pray need not have limits. How we intercede for them may be less important than the fact that we do so. “Intercession is an essential aspect of being a part of the human family and a part of the Body of Christ,” said Dr. Heron. “In terms of our shared humanity, intercession enables us to cultivate compassion in conversation with the Lord. Intercession is expansive, endless. We may intercede for anyone. And it has as much to do with us as we pray as it does with the person for whom we pray. Within the practice of prayer, it is a gesture of solidarity. Really, it’s a supernatural extension of our natural response to the suffering and need of others. When we observe our fellow humans suffering and in need, it seems inappropriate to just stare. We must do something. “In addition to physical assistance in whatever form it might take, it seems appropriate to us to acknowledge or to recognize suffering and need. Human suffering and need prompt us to do more than fix them as problems that demand solutions. We talk about the suffering and need we see, share it with others in our lives then hope and fear for others out loud or in our own minds. “In history, we have made monuments to the suffering of others. Intercession is a reasonable and healthy extension of this activity. We are self-consciously bringing this recognition of suffering and need into the presence of God with us. Remaining silent about suffering and need seems to us to be almost criminal. It would be strange to remain silent about it in our intimacy with our Creator,” said Dr. Heron. He cites practical and personal examples of impacts on his life when others have prayed for him. “For some reason, when I was a teenager, a woman in my church prayed about and for me quite a bit. She came to me later and told me that she felt I would be involved in reconciliation work in my life,” said Dr. Heron. “Her prayerful consideration of my character and her intercession on my behalf have shaped the way I envision relationships in my life. Her prayers about and for me helped me understand myself in a clearer light. She spoke to the Lord about me and was able to say something to me that was surprising but, in a way, expected. I have lived differently because of her intercession,” he said. “I also have a job at Mount Marty College because a venerable Benedictine sister prayed for me. This was a much more straightforward case of intercession. She is a holy woman. The Lord loves to hear her,” said Dr. Heron. Those examples give evidence that not only do we need to offer our thoughts and prayers to others, sometimes we need to be open as the recipient. “While you’re in seminary lots of people offer to pray for you and frankly, for a while I took it for granted,” said Fr. Thuringer. “But at a certain point it dawned on me exactly how many people were praying for me – my parents, friends, classmates, friends of the seminary, religious brothers and sisters and the list goes on. I was overwhelmed. Since then I take people’s prayers very seriously. They mean the world to me,” he said. “It always stops me, in a good way,” said Kueter. “It’s easy to get caught up in the mechanics of medical treatment and the expectations of dealing with your illness. Your mind is focused on each step. When someone shares their personal thoughts and prayers with me, I am transported out of that worldly sphere and am reminded of the bigger picture and the need to refocus on that,” she said. “I believe communicating your concern for another person is valuable no matter what words you choose. If someone tells me their thoughts and prayers are with me and my family, I take them at their word and say thank you. I would encourage the outreach always and urge people not to worry about the exact words to use,” Kueter said. “It is lovely to receive prayers from another, or even that someone would take the time to think of me,” said Henrickson. “Recently, to celebrate an accomplishment of mine a friend had a Mass said for me. That is a very meaningful and thoughtful gesture filled with action. This was also quite humbling to receive,” she said. “I offer many prayers for many people every day. Most are not accompanied by a verbal confirmation of being ‘in my thoughts and prayers’. I ask the Lord to conform my thoughts to His. As people/situations cross my mind I try to receive the grace needed to quickly move that thought to prayer. To pray for others in large and small ways is very humbling. It means I have the privilege of sharing in a very small way life with Christ,” Henrickson said. 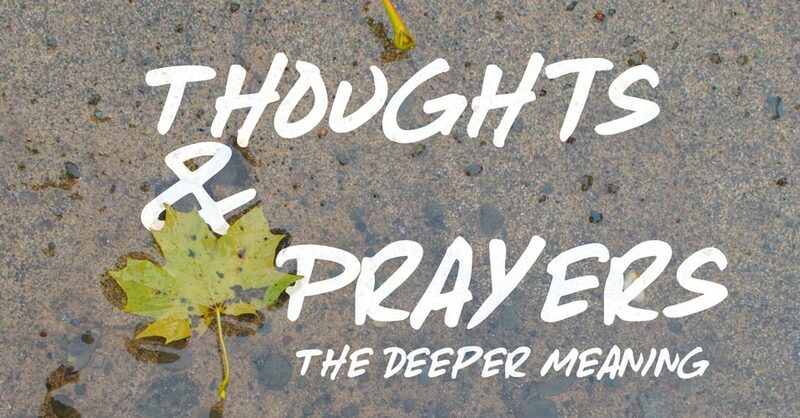 Going deeper might mean taking our thoughts about someone and moving it into prayer for them. But we still might understandably wonder if praying for someone is enough. Might our prayers lead us to action? “Praying for others should always involve listening. After all, God is not a customer service department, but a loving Father,” said Fr. Thuringer. “After you pray for someone take a few brief moments to let God speak. In that listening silence He might ask something of you; maybe there’s something that you can do for that person. Or he might just leave you in peaceful prayer. Be sure of this, if prayer is to lead us to any action, it should come from God,” he said. “This question shifts the focus from ‘thoughts and prayers’ as a saying to a premise of a ‘commitment to pray’ for another,” said Henrickson. “Growing in our commitment to prayer is an initiative that originates with God that an individual can respond to with generosity as one grows in closeness with the Lord. “Certainly, the closer I am to someone, or a situation, my ability to take more action in addition to prayer increases, because I have the awareness of what may be useful or needed: a phone call, a card, a meal, time, money, companionship, service, transportation, respite care., etc. When we share life with others (family, parish family, community) we are given frequent opportunities to respond,” she said. Dr. Heron notes that prayer may lead us to something more, but it doesn’t have to. “It would be strange to pray for someone and then do nothing for that person if you were in a position to help through your actions. In the New Testament, James’s letter and John’s first letter are clear about this,” he said. “But we have to be careful here: if we say that prayer should lead to something more, it can easily seem like prayer is the stuff we do before we get down to the business of being really helpful. But I think this is out of sync with how Jesus taught us to pray and how the saints have patterned themselves after him. Prayer is not an empty gesture or a social convention,” Dr. Heron said. “Does this mean that every intercession must lead to action? No. That would be impossible. But if sanctification is real, and if James and John are right about what sanctification entails, then intercession is a part of making a person more sensitive to reality, more docile to the presence of suffering and needs in others, and so more creative and wise in active response to the suffering and needs of others. The saints prove this true again and again in startling ways,” he said. One might be overwhelmed watching the news from around the world and feel the need to respond with more than thoughts and prayers. “It’s always good to keep the sufferings and concerns of the wide world in our prayers. Does that mean we have to leap to action every time we see something bad on the news? I don’t think so,” said Fr. Thuringer. “Now, I don’t think he meant this literally. He meant that the clearest way he could make the world better was to be a saint. Do you want to help make the world a better place? Focus on becoming a holier version of yourself,” he said. Henrickson said, “We know that a number of researchers have established a connection between increased anxiety/stress/overwhelmed and feelings of powerlessness connected to a news-saturated media culture. “In the context of this discussion, it is prudent to listen to what the Lord teaches us, in John 14:1 he tells us, ‘do not let your hearts be troubled, believe in God and believe in me.’ Anxiety is a feeling of worry, nervousness fearfulness, tension about an upcoming event, imminent event or connected to situations or circumstances that are outside of our control. Feeling overwhelmed can inhibit our ability to take action. “There is a famous prayer that can put perspective on this,” Henrickson said. “The 12 steps made it well known, however, the longer version is not as well known. The Serenity Prayer by the German Protestant Theologian Reinhold Niebuhr (see left). “It is useful and good to not just think about the world we live in, but to pray for the global world we live in and for the needs of people … and to place all of these cares and concerns in God’s loving arms, for He is love and His goodness, truth and beauty extend immeasurably far beyond the reaches of humanity. Let Jesus be the Lord of your thoughts and prayers. Trust,” she said. Dr. Heron suggests that the Good Samaritan provides us with another example of considering whether prayers are sufficient or whether God might be inviting us to something more. “The first thing to remember is that the hero of the story is the Samaritan, someone Jesus’ audience would have despised as a pagan or a heretic or trash. So, Jesus challenges our ideas about the scope of our care by making someone supposedly outside the scope of care the one with a beautiful and expansive heart. In this way, the Samaritan – the outsider, the trash – is more like the Father than the devoutly religious are,” he said. “The second thing to remember is how Jesus shows the beauty and expanse of the Samaritan’s heart. It’s a lovely detail: the Samaritan takes the wounded man to an inn and cares for him. Then the Samaritan leaves the next day. So, this beautiful Samaritan interrupts his own life and spends the night tending a wounded stranger. “So, from Jesus’ parable, it seems there are degrees and there aren’t degrees. Who is your neighbor? I don’t know! Look around! The people you find when you look with Samaritan eyes will probably be people who need you. What should you do for them once you see them? I don’t know! What are you able to do? “It is probably important that Jesus did not tell us a story about someone who started an agency or a program to help people in need. Instead, he told us a story about a man who looked at what was in front of him and responded in a way that teaches us about what God’s heart looks like. It would be an incredible challenge to us to measure our willingness against the Samaritan’s overnight stay. It would be a step on the road to sanctification – becoming icons of the Trinity,” Dr. Heron said. Kueter notes that seeing an example, perhaps like the story of the Good Samaritan, often encourages and moves us to action as well. “When someone tells me they’re praying for me, I am moved to do more for others, in prayer and action. “Figuring out what that action is can be challenging, as is getting beyond dwelling on my own problems and thinking and acting to aid someone else,” she said.